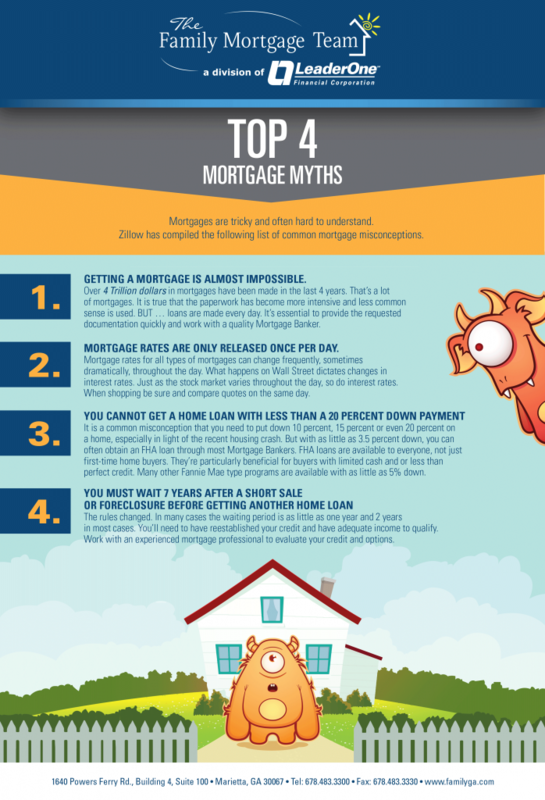 With the many changes to the mortgage and real estate industry over the past few years, there seems to be a lot of he said, she said information being passed around. At The Family Mortgage Team in Atlanta, our job is to educate our clients as much as possible up-front. And this goes for everyone; whether you’re a first time homebuyer or purchasing your second investment property, every loan and every situation is different. So we’ve put together this infographic to clear the water of a few of the most common myths. Still have some lingering concerns or questions? Call us! We’re more than happy to help in any way!